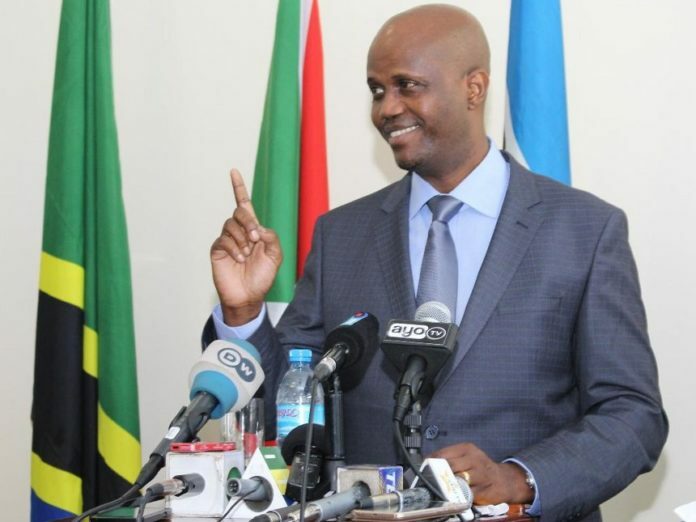 The East African Community (EAC) Secretary General Amb. Liberat Mfumukeko has said the region is without doubt, on the right track with significant achievements registered in 2018 despite few challenges. Delivering the New Year address 2019 to the staff of the EAC organs and Institutions, Mfumukeko informed said that in 2018, the EAC set a record in resource mobilisation. He disclosed said that over US$100 million was mobilised from various Development Partners to support various projects and programmes in the Community. In addition, the EAC and USAID signed a US$20.5 million agreement for energy projects. This is in addition to the more than US$200 million mobilized from USAID in the past two and a half years, added Mfumukeko. Furthermore, he disclosed to the staff that the African Development Bank (AfDB) and African Development Fund (ADF) approved US$2.5 billion for the implementation of new and ongoing priority infrastructure projects in the EAC region. The official said that Partner States continued implementing road and railway projects in the Central and Northern Corridors including the Arusha-Tengeru Dual Carriageway and Bypass Road. He said both roads are part of the Multinational Arusha – Holili/Taveta – Voi Road, which is a successor of the Arusha – Namanga – Athi River Road, both of which have been completed. The upgrading of the 37 km Ntungamo to Mirama Hills Road to bitumen standard has significantly improved access and speed for freight and passenger services between Uganda and Rwanda, and lower transport costs on the Kampala-Kigali route. Feasibility Studies and detailed designs for two multinational road projects have been completed. (i) The first multinational road project will link Tanzania and Burundi through Nyakanazi –Kasulu /Rumonge – Bujumbura. EAC has recently mobilized over USD 340 million from the African Development Bank for construction of this road to be undertaken soon; and (ii) The second road links Tanzania and Rwanda through Lusahunga –Rusumo / Kayonza – Kigali. In addition, the EAC has provided support to the successful implementation of the Lake Tanganyika Transport Programme which will yield numerous benefits for the riparian states and the communities around the lake. He added that the EAC through its Institutions such as Lake Victoria Basin Commission (LVBC) and Lake Victoria Fisheries Organization (LVFO) is implementing numerous projects on Lake Victoria to improve port infrastructure, navigation safety, fisheries and to fight pollution of the Lake. The Secretary General said the region’s main priority was to attain the full roll-out of intra-trade and imports regime under the Single Customs Territory. A pilot roll-out of exports under the SCT was successfully implemented and 736 multi-level users trained in SCT processes. On One Stop Border Posts (OSBPs), Amb Mfumukeko stated that 13 One-Stop-Border Posts were operational in the region. The operationalization and training of personnel at the OSBPs has significantly reduced the time taken by travelers and trucks at the borders from several days to about 15 to 30 minutes on average. In addition to further enhance trade in the region, the EAC Common External Tariff structure and rates were reviewed and aligned to the global changes of trade and current economic environment in the EAC. Up to 41 Non-Tariff Barriers were eliminated. Mfumukeko disclosed that in an effort to further improve the lives of the citizenry, the EAC has established Centers of Excellence for Higher Medical Education, Health Services and Research. These Centers of Excellence including;The East Africa Kidney Institute in Kenya; The East Africa Heart Institute in Tanzania; The East Africa Cancer Institute in Uganda;The East Africa Nutritional Sciences Institute in Burundi;The East Africa Biomedical Engineering Institute in Rwanda; and The EAC Regional Center of Excellence for Vaccines, Immunization and Health Supply Chain Management in Rwanda. These centres of excellence contribute to the development of relevant and highly skilled workforce in biomedical sciences to meet the Community’s immediate labour market needs and support implementation of EAC’s ‘free’ labour market protocols. He informed the staff that the Secretariat commenced the process of launching an East Africa Automotive Industry platform as a way of implementing the EAC action plan for the automotive sector. The Secretariat has similarly developed draft strategies for cotton, textiles, and leather sectors that will serve as policy instruments to reverse dependency on export of raw cotton and hides and skins, and facilitate development of local supply base of clothing and footwear, and the creation of jobs and reduction of poverty in the region. Mfumukeko said that the implementation of projects under the East African Power Master Plan has shown a positive improvement on power supply. “All the Partner States’ electricity generation capacities exceeding their peak demands will raise to significant levels when committed generation projects in the Partner States are commissioned from about 555MW in 2017 to 1,083MW in 2018 and to about 7,480MW by 2022. In this sector, there has been an unprecedented level of resources mobilized”, noted the EAC Official. Mfumukeko informed the Staff that the EAC Secretariat undertook joint tourism promotion at the major international tourism trade fairs in Berlin and London to increase the visibility of EAC as a single tourism destination, and to promote intra-regional tourism and enhance co-operation among tourism players within the region. Furthermore, the review of Classification Criteria for Tourism Accommodation Establishments and Restaurants commenced in August 2018. The review aimed at taking into account the international tourism trends and best practices in order to ensure that the region enhances its competitiveness and position itself adequately in the global tourism market. The Secretary General disclosed that the sector accounts for 25 percent- 40 percent of the EAC Partner States’ GDP and is a leading employer for over 80 percent of the population in the region. The EAC remains strongly committed to support implementation of the Malabo Declaration on Agriculture Growth and Transformation in Africa. In 2018, the Sectoral Council on Agriculture and Food Security adopted the EAC Regional Agriculture Investment Plan (RAIP), which is a key instrument in rallying financial and technical support to spur agricultural transformation in the region. Furthermore, in 2018, EAC made headways in supporting entrepreneurship in the Agricultural sector. With support of FAO, a program was implemented to build capacity and provide financial support to young entrepreneurs in the agriculture sector. Also, in collaboration with the German Federation of Industries, GIZ and the East African Business Council, a program was initiated to mentor and help growth of small and medium enterprises especially in the field of Agro-processing. Meanwhile, Mfumukeko informed the staff that Auditors General from the EAC Partner States, reviewed and signed the Audited Financial Statements of the Organs and Institutions for the Financial Year 2017/2018. The Audit Commission issued 18 signed certificates with unqualified – clean opinion for three organs, eight institutions and seven projects (a total of 18 EAC structures).